We will lead you through the process of designing and programming your ideal solution. We not only take the time to understand the technology, but we take the time to explain it to you to ensure your system meets your dreams. We design, sell, install, and support your entire system as your Lifestyle Technology partner for life! The revolutionary Universal Remote MX-6000 brings the power of WiFi networking to the home theater, without compromising simplicity. The Universal MX-6000 is the first home theater remote control to offer two independent communications and control methods simultaneously. The affordable MX-450 is an exercise in cutting edge design combining extraordinary functionality with a beautiful color interface. Whether you are controlling one component or two dozen, the MX-450 keeps you in control. With three main pages that support up to 24 audio or video components your remote can expand with your home theater. Go beyond text and experience engaging graphical icons for devices, activities and popular favorite channels. The MX-450 revolution doesn’t stop with form and function; it extends to powerful installation tools. Universal Remote Control has provided advanced functions that allow custom installers to fine tune your remote for your needs. The built-in remote program navigator allows your installer to program and edit in real-time directly on the LCD screen. The only stand alone, customizable remote control that allows our installer to archive your unique program file. Utilizing special MX-450 software, we can easily back up your control configuration. This special software also allows the MX-450 to stave off obsolescence by downloading updates with the latest firmware and IR library for new products. Something that enables you to hear your favorite music anywhere in the house, watch your favorite programs, dim lights to match the mood, and shows you who is on your front doorstep — all from the comfort of your couch? A seamless solution that connects you with your home and loved ones in a whole new way. The 7-inch capacitive-touch panel is part of URC’s new Total Control line, which adds cameras, lighting control, multizone audio and energy management to URC’s rich remote-control capabilities. 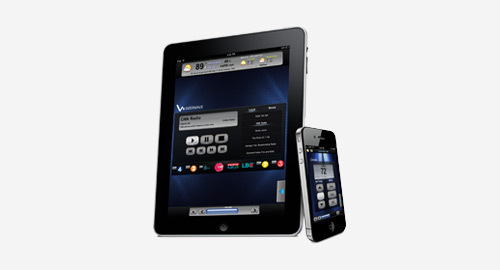 The Total Control iPhone/iPad app provides full end-user control of a URC Total Control system. 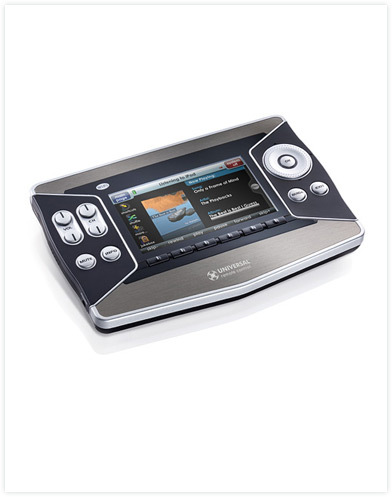 The experience is similar to that of URC’s TKP-2000 In-Wall Two-Way Network Touchscreen, including full cover art and metadata when used with the SNP-1 Streaming Network Player, which delivers Internet radio and subscription services like Rhapsody, Pandora and Sirius XM, and the PSX-2 Personal Server, one of the industry’s most advanced iPod/iPhone docking stations. The app also provides support for selected third-party modules.